If you love snickerdoodle cookies but are looking for something a little different the norm, you might want to give these Apple Pie Snickerdoodles a try. They look great, taste delicious, are easy and fun to make and vegan too!! 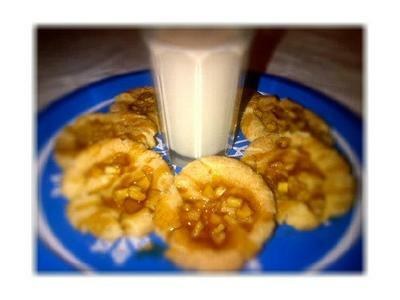 In a small bowl, stir together the 3 TBSP sugar and 2 tsp cinnamon and set aside for cookies. Now you can get started on the filling. Heat the 3 apples, juice and saute for 10 minutes, or until softened. Stirring frequently. Stir in the 3/4 cup caramel sauce (recipe below) and continue to cook until it incorporated. Remove from heat and wait to use for cookies. To make the cookie dough, stir together the dry ingredients. In a bowl with a paddle attachment, cream the 1 cup earth balance butter. Add the 2 cups sugar and continue to mix, then add the egg substitute, 1 TBSP corn syrup, and 2 1/2 tsp vanilla, and mix thoroughly. Add the dry ingredients and mix until blended. Chill dough 1 hour if it's sticky or difficult to handle. Roll balls of dough about the size of a walnut or 1inch ball then roll them in the cinnamon sugar to coat. Place on an ungreased sheet pan 2 1/2 inches apart.Use your index finger or 1/2 teaspoon measuring spoon create a depression in the center of each ball.Fill each indentation with nearly 1/2 teaspoon of the apple mixture. Bake for 10 to 15 minutes, they will puff up and the surface will slightly crack. Let cool on the sheet pan a few minutes before removing to a wire rack to cool. Melt 1 cup earth balance in a medium sauce pan over medium heat, add 1 cup brown sugar, 1 cup corn syrup, 1/2 tsp salt, 1/8 tsp cinnamon and 1 tsp vanilla, continually stir until the mixture simmers.Once it is simmering add the 1 tsp baking soda, remove from heat and keep stirring! The mixture will foam up, keep stirring until you achieve a smooth texture with no large bubbles. Now it is ready to use for the sauted apples and to drizzle on the cookies, use a spoon and slowly zig & zag on each cookie. Let cookies cool in fridge so the caramel can set on top.